Ummmmmmmmmm…so these are INCREDIBLE….YUM! 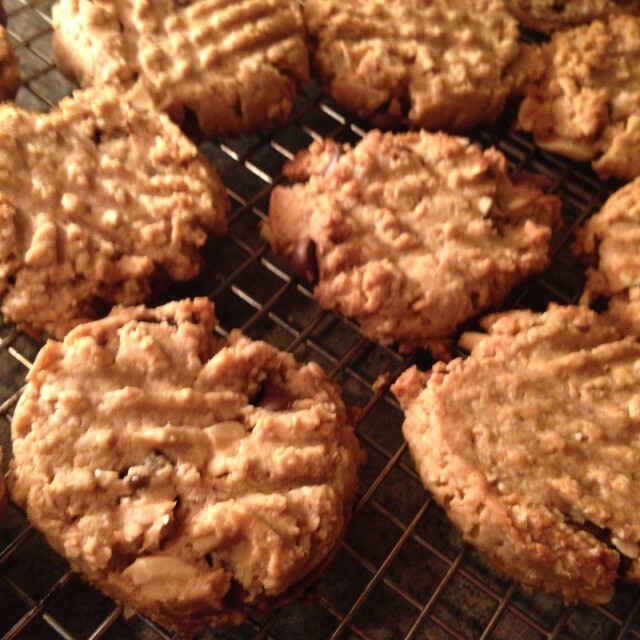 Peanut Butter, Chocolate….YUM-NESS. In a food processor, put the oats in and grind them until they become flour-like. In the same processor, coarsely grind the peanuts. In a bowl, mix all of dry ingredients together, the flour, ground oats, almonds, chocolate chips, cinnamon, salt and baking powder/soda. Mix the wet ingredients together; the peanut butter, coconut oil and maple syrup in a blender if need be to get well incorporated before adding into the dry and mix with a spatula until everything is well mixed. Scoop or spoon out onto baking sheet with space in between. Using a fork, create a criss cross pattern across the top applying with gentle pressure. Bake for 10 minutes. Turn the pan (s) and continue to bake for another 5 minutes or until golden brown. Let cool for at least 5 minutes and then remove them to a cooling rack. This entry was posted in cookies, Gluten Free, holiday foods, nuts & seeds and tagged animal free, dairy free, eat local, fricken delicious, fricken yum, gluten free, gluten free vegan cookies, non dairy, quick protein, THE VEGAN LOVE PROJECT, vegan cookies, whole food love, whole grain. Bookmark the permalink. oooo lala!! My absolute favorite combo.. peanut butter and chocolate. Can’t wait to try these bad boys! !